1.Who are your favourite characters from ‘The Reengineers ‘? 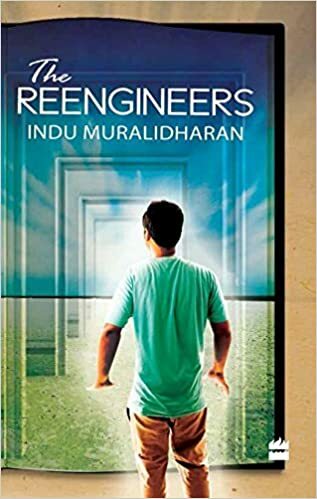 The Reengineers is the coming of age story of Chinmay, of his transition from a timid, suicidal fifteen year old boy to a confident young man who is fully aware of his power to create his destiny. As the hero who writes his own destiny, Chinmay is my favourite character. I also enjoyed writing the Professor, a wise spiritual teacher adored by his students. He is far from perfect, and is too aware of his fallibilities as shortcomings both as an individual and as a spiritual Guru. It was fun writing the comical villain Govind. I like the character of Aunt Kalyani who is a strong and independent woman, broadminded and generous, who chooses to live in the memory of her late husband – the charismatic poet Uncle RK, by reading his poems and playing ragas of love and longing on her Veena at night. Having said that, this is my first published novel and all the characters are dear to me. 2. Do you believe in love and of what kind? To me, love is the primal energy that enables any kind of creation. All manifestations of love are beautiful and inspiring. C.S. Lewis talks about the four kinds of love – Storge (Empathy, filial love), Eros (Romantic love), Phileo (Friendship) and Agape (Divine love). Extending this, there is love of one’s work, love of art, love of a cause, love of a goal, patriotic love and love for humanity as a whole. A person ideally needs a balance of all kinds of love in their lives, but the proportions of the kinds of love would be unique, specific to each individual. 3. What are your forthcoming projects? Any romances in it? I am finishing the second draft of my second novel, which is an exploration of man-woman relationships through the twentieth century and till the present day. There are no boy meets girl scenarios in it, but plenty of complex situations involving power and energy balance between the genders in a relationship. This comes through the frame of a conversation overnight by a couple of friends, who analyse real stories of their friends and family to find a theory for what makes the perfect relationship. My third novel is a light-hearted story of a young woman who runs a very unusual counselling service. I am also working on a narrative nonfiction project, which explores paranormal and esoteric practices. 4. Who is Indu Muralidharan? In response to this question, let me share a version of my autobiography that I wrote recently for a class exercise. Who am I? Asking this question is my first memory of life. I was three years old, and it seemed inadequate to define myself with the answers that I was given, which were all in terms of attributes attached to me at birth – name, family, religion, race, and nationality. At seven, I wanted to renounce the world. The life cycle of human beings seemed no different from that of butterflies, with one stage of life following another in tedious sequence. At fifteen, depression struck me. I took to living in libraries, and buried myself in a tomb of books, from where I was reborn, after years. As I returned from darkness to light, I wrote my first novel. Simultaneously, I rewrote my life, reconstructed my reality. Electronics engineer, ecommerce manager, literary writer, eclectic reader: out of the many dimensions of my identity, I choose that of the seeker to define me. In ‘The Power of Myth’, Joseph Campbell mentions three Sanskrit terms – Sat, Chit and Ananda: Being, Consciousness and Bliss, each of which lead to the ocean of transcendence where all searches end. Like Campbell, I rejoice in following the path of my bliss, seeking the meaning of self and reality in the study and practice of literature. 5. Who is person whom you look up to for help? As a seeker deep into new age practices, I naturally look up to the Universe for help and I have found my answers and directions most of the time in books. From personal experience, I know that the only person whom you can count on always, is yourself, which is the lesson that Chinmay learns in The Reengineers as he realises that he can rewrite his own story. 6. Your favourite pass time is? I enjoy long walks, listening to classical music and acid rock and also birdsong in the early mornings, conversations with friends, being part of gatherings where poets and scholars meet and read. However what I love best is reading and writing, and my desk is where I spend most of my time after work. Books energise me. Next Next post: What does The Reengineers mean to me?